Prior to 2001 this land was mostly forest with a cross country ski trail winding its way back and forth across the side of the hill. 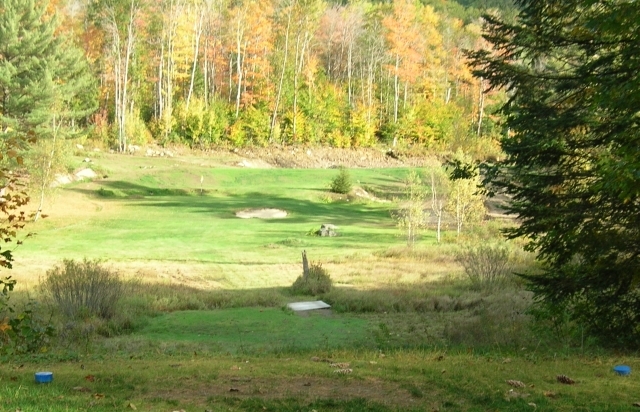 The attempt at a golf course was started in July, 2001, as just a practice area to hit golf balls. (See photos left - before and after.) My wife and I built a small green with real creeping bent grass and later we picked up a walk-behind Jacobsen 22” Greens Mower. Then we decided to have some of our 30 or so acres of woodland clear-cut to make possible fairways, if we really wanted to continue. 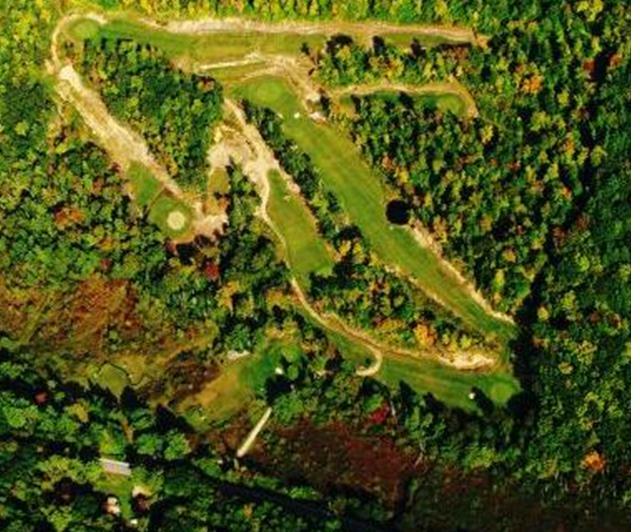 In the fall of that year a local logger and friend, Doug Clark, started clear-cutting fairway areas that would give us a potential nine holes. Doug had an excavator and a bulldozer, and we asked him to rough-grade a few of the cleared areas. Over the next few years he did an excellent job grading, ditching where needed, and digging three ponds for irrigation. Most fairways run across the hilly terrain, and are about 100 ft. wide. Another fortunate event occurred that helped considerably. A local saw mill was clearing a field to expand their lumber stacking area, and had a lot of loam to dispose of. So we bought 2,000 yards of beautiful, stone-free loam for future use on the fairways. In 2002 we started shaping a couple of holes using our John Deere medium-sized tractor, which has a bucket and back hoe on it, and built a couple more greens, using modified USGA guidelines and creeping bent grass. We sought and received excellent advice from some course superintendents, including Tom Brodeur (TPC Boston), Mike Cummings (Dennis Pines & Dennis Highlands), Joe Langley (White Mountain Country Club), Charlie Dickow (Lebaron Hills Country Club), and Randy Margeson (Highland Links Golf Course). At the start, most of the maintenance was done manually and with a small John Deere Lawn and Garden tractor. Over the years we accumulated a couple of riding mowers to cut down on the time necessary to mow the expanding fairways. Currently there are nine playable holes. An aerial view is shown at the right, taken by Chuck Lewis.